Amigo shop, Level 1, Brunel building. Open Monday to Friday 7am-8.30pm and weekends & bank holidays 8am-8.30pm. Offers sandwiches, snacks, drinks, sweets, stationery and essentials. Costa Coffee Shops, Level 1, Brunel building. There are 2 Costa Coffee Shops, open Monday to Friday 7am-8.30pm and weekends & bank holidays 8am-8.30pm. 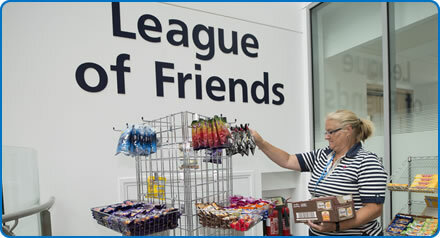 The League of Friends Coffee Shop, Level 1, near Gate 36, Brunel building. Open Monday to Thursday 10am-7pm, Friday 10am to 5pm and weekends 2pm-5pm. Vending machine, Emergency Department, Gate 35, Level 0 offers drinks, snacks and sandwiches. There are vending machines available. The League of Friends Coffee Shop is located in the main reception area, Level 1. Open Monday to Friday 9am-4pm.